This page contains a selection of recent news stories from De Flow and the Neftemer consortium in which we play an active part. 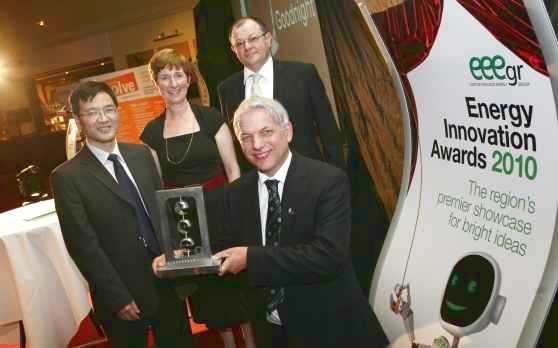 A system which detects and controls unwanted accumulations of liquids in pipelines from offshore rigs has won for Suffolk company Neftemer Ltd and Cranfield University the first prize of the Energy Innovation Awards 2010, organised by EEEgr (East of England Energy Group). Neftemer director David Whittingham said that the advanced slug detector could help save some of the billions of dollars a year lost in oil production. It could also extend the life of North Sea facilities, where older wells are more likely to suffer from slugs. These form because of the declining upstream pressure and can severely restrict flow. “The team is very happy to win the award. As well as being useful for the North Sea, we believe the advanced slug detector can boost the UK’s export market. It can be used to upgrade existing platforms, is easily attached and is simple to operate. “I must thank all the members of the Slug Detection Consortium, from Chevron, Endress and Hauser, the SPT Group, PERA, Cranfield University and Neftemer Ltd. Special thanks go to Frank Knight of the TSB (Technology Strategy Board)”. John Balch, chairman of the judges and strategic director for NWES (Norfolk and Waveney Enterprise Services), presented the award to Mr Whittingham. Dummett Copp, EEDA (East of England Development Agency) and DECC (Department of Energy and Climate Change) sponsored the award ceremony. Read the story on the EEEgr website. 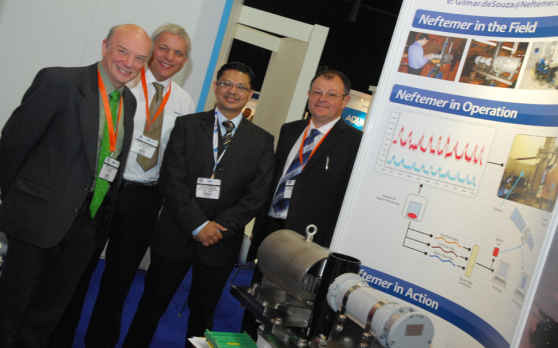 With the support of the East of England Energy Group (EEEgr) and other East of England agencies, Neftemer participated in the recent Offshore Europe 2009 Oil and Gas Exhibition in Aberdeen. Considerable interest was shown in Neftemer's Multiphase Meter, and the company ended the exhibition with 50 major business leads to follow up, including visitors from Saudi Arabia and Brazil. Offshore Europe 2009 was very well attended, indicating a high level of optimism in the oil and gas industry. Neftemer's directors also undertook a great deal of networking during the event, including a meeting with friends from the Lousiana Development Association (LDA). See earlier story. The Letton-Hall Group, a Houston-based global oil and gas measurement consulting firm, announces that the nonprofit Research Partnership to Secure Energy for America (RPSEA) has awarded them a deepwater measurement research project designed to improve sustainable energy reserves for the nation. "This project is significant because if successful, it will clear the way to more affordable, more realistic deepwater production," says Jim Chitwood with RPSEA. "The current situation in deepwater exploration is that often companies drill several deepwater wells and commingle production. Measuring the flow from each well and allocating the oil and gas production is a big issue at those depths." At risk are significant revenues from oil and natural gas production, as well as possible impacts on royalty payments. Both the Department of Interior and Department of Energy have called for advances in technology to address issues in measuring and monitoring deepwater production. Says Chitwood, "This project should assist in addressing those technology gaps for everyone." In addition to government funding, the project is partially funded by a coalition of oil and gas concerns, including BHP Billiton, BP, Chevron, ConocoPhillips, Shell, StatoilHydro, & Total. Each firm contributed an equal amount to the effort. Jim Hall, PhD and co-founder of the Letton-Hall Group, says, "This is one of the first and one of the largest deepwater contracts that RPSEA has ever awarded, we`re proud to have been selected to lead the Deepwater Measurement Project." "The Letton-Hall Group has proven expertise in ultra deepwater measurement," says C. Michael Ming, President of RPSEA. "Their integrated approach to this complex challenge is exactly what the program is looking for to address the unique technology and architecture challenges associated with ultra-deepwater operations, and we are glad to have them onboard." For this project, the Letton-Hall Group will specifically tap two companies with further expertise in deepwater. Oceaneering International, the world leader in remotely operated subsea vehicles (ROVs), and Multiphase Systems Engineering, international experts in compact multiphase separation technology, are rounding out Letton-Hall Group`s research team. Innovation solutions company Pera announces the signing of a major two year DTI project for developing a slug control system. Pera's partners in the collaboration program include Cranfield University, a major oil company, Neptune Deeptech Ltd, SPT Ltd, Endress +Hausser Ltd, and De Flow Ltd. The project is being managed by Pera at Melton Mowbray. Severe multiphase slugging flow, whereby pockets of liquid cause blockages due to lack of upstream pressure, is a problem especially related to mature oil field operations such as the North Sea. As an oil well ages, gases and fluids mix in the flow lines resulting in large pressure and production fluctuations, which can give rise to operational hazards and even damage. Conventional slug mitigation measures involve slowing down oil extraction, and could reduce oil production up to 10%. To counteract this problem, the consortium will use platform based instrumentation coupled with novel algorithms and software to manage data with the goal of timely prediction and control of slugging flows on off-shore platforms with a minimum impact on normal oil production. The technology will increase oil production, and well life will also be extended - slug induced losses are currently £6bn each year worldwide. The control system will be easy to install and economically competitive with revenue opportunities and benefits for the UK North Sea extraction industry and other such world-wide applications. Louisiana Global Alliance (LGA) facilitates business alliance between companies in Louisiana and the United Kingdom. Several local Louisiana economic development organizations, ports and utilities helped form the LGA these organizations have embraced the call to be part of an aggressive international business development. This is achieved by marketing effort and Louisiana's foreign direct investment indicates that the state is participating in the global economy and is accessing larger markets. "International trade strengthens Louisiana companies, increases employment and bolsters the Louisiana economy," said LGA Assistant Secretary Don Pierson. "With the assistance and participation of our partners, LGA has significantly enhanced international marketing efforts in recent years. Currently, Louisiana has representation in four major global markets. Louisiana's extensive waterway and port system give the state unique access to international markets. We must continue to exploit this key strategic advantage to its fullest." LGA will continue to aggressively market Louisiana internationally to further diversify their economy and expand the global market for resident industries.